The Legends learn of a time aberration in Chicago during 1927. As they assist the Bureau of Prohibition with stopping Al Capone, they learn the aberration is caused by Darhk and Thawne, along with their newest ally: Malcolm Merlyn. My favorite part of this episode was the time period and setting. I've always been fascianted with the roaring 20s, so I was stoked when the Legends traveled to Chicago during 1927. 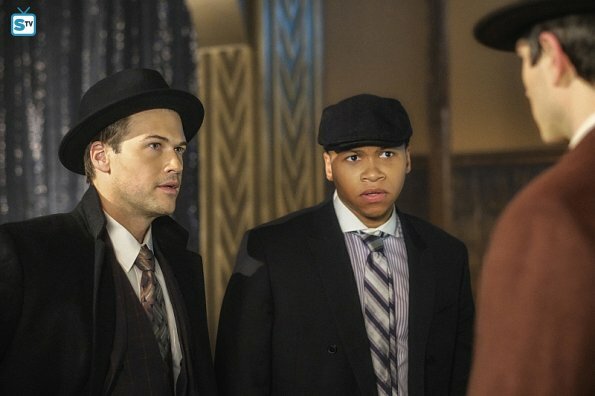 The clothes--fedoras, flapper dress, Amaya's hat--along with the speakeasy and mob bosses were fantastic. Al Capone was okay for what this show is. But the whole time period was so fun to watch. More please! Although this got them into trouble, Ray and Nate's rivalry over "who is better" is hilarious. They're such nerds. I love that they sparred together (and mimicked Sara together) and bickered about who was the best during the entire episode. It was great to see them team up in the end though to fight the mob. Never change, cupcakes. Stein continues to come to terms with having a daughter, and it's adorable. He also showed a lot of bravery and strength by telling Sara the truth. And being tortured. Basically, Stein is becoming a better character as the show progresses. Sara is one the greatest aspects of this show. She's a great captain and deserves to be in charge. In addition, she's grown so much since last season. I love it. She also continues to learn, especially when it comes to the rest of the Legends. Giving up the amulet for Stein was a hard decision, but I'm glad she made it. It was also fabulous to see her fight Malcolm Merlyn. Hands down, Mick is the MVP of this episode. His comments, as always, were spot on. His "conversations" with Snart were perfect. (Also, hello, Leonard Snart! Come back for real next time, dude.) And he saved the day by thinking like a criminal. It was so fun. From the "Bonnie and Clyde" reference to literally tricking a bad guy with a "your momma" joke, Mick made this episode worth watching. She becomes better every episode as well. I love her powers and how they incorporate that with the fight scenes. Her relationship with Mick is interesting, and I'm curious about how it'll pan out. I don't wholly ship them because I can't imagine it'll end well, but a part of me wants their opposite personalities to help one another become better legends. Also, Amaya fighting Thawne was great. She is so much better than Hawkgirl last season. We finally learned what happened to Rip. Apparently, he's stuck in 1967... as a movie director. First off, what? Second off, yes! This means at some point the Legends will got to 1967 in Hollywood, which will be so much fun. I'm wondering though what in the world Rip is doing there? And why movies!? It's not good that Darhk and Thawne have teamed up with Merlyn. First off, how? Second off, why? What is Merlyn getting out of this? The whole episode had me worried because it was so obvious they were scheming and the Legends never saw it coming. But I'm also a little happy Merlyn is around because I've missed John Barrowman's performance. I'm kind of annoyed that the Legends get themselves in so much trouble. I know it's a TV show and the stakes have to be raised, but they get kidnapped or tortured or do something stupid every single episode. They never learn. I could tell Stein wasn't himself, but only Jax noticed--and he noticed too late. They also gave up the amulet, which is actually a compass and leads to the "Spear of Destiny" that can rewrite reality. I know they did it to save one of their own, but they didn't even try to come up with another option. Right now, the only thing they're legends at is screwing everything up. Overall, it was a fun episode for a fun show. Nothing pressing happened except Merlyn joined the squad and they gave up the amulet. I'm sure that will come back to bite the Legends later, but for now, everything is all cool. Except for Rip. What is he doing in 1967? And why is he a movie director? I need answers about him more than anything else. See you in January, Legends. What did you think of "The Chicago Way"? What do you think Rip is up to in 1967?